In 1951 when commercial color television broadcasts began, Ken Bollinger was managing a repair department for a TV distributor. The distributor was poorly managed and a couple of years later went out of business. Ken saw the demand for TV repair and decided to start his own business by repairing TV’s out of his home, with his wife, Veloy, acting as secretary. Back in the early days of home electronics repair, it was primarily performed in the home. The service technician would come to the home armed with his tube caddy (suitcase full of tubes), with hopes of one of them repairing the set, which it did most of the time. However, in some cases it did not and the set would need to go to the shop for a more in-depth repair. In a majority of the cases the technician would remove the innards of the tv set and leave the cabinet and CRT in the home and haul just the chassis to the shop where the shop tech would connect it up to a test jig and perform the needed repairs. In those days not many parts and/or tubes were required to be stocked because there were very few brands and models of TV sets and they used a lot of the same parts. Additionally, televisions in those days were a luxury item and were very expensive – a TV cost about half the price of a car! People tended to keep them for many, many years. Nowadays, TVs are smarter, the technology is better, and the components are less costly. People have been trained that when something breaks it’s time to upgrade. However, we at TVS Pro (TV Specialists) know that often times it is much more economical to repair a piece of equipment instead of dumping it to buy the latest and greatest. The challenges of modern day electronics service are many; gone are the days of households with one television, a couple of radios, and perhaps a phonograph – and it really was not all that long ago. Electronics in our daily lives have grown exponentially into a fully engaged lifestyle. I don’t think most of us give a moments’ thought to how many electronic gadgets we interact with each day, and manufacturers are always thinking up new ones to sell us. Do you know anyone who only has just one TV? With the advent of computers, cell phones, DVR’s, Home Theaters, flat panel displays in a dizzying array of shapes, sizes, and colors, and now Smart TV’s, Smart Phones…and all of them connected to the internet! I think you get the picture…we live in an age of technology. In this age of technology, electronics servicers are expected to be able to deal with all of it, no matter the technology it harbors inside. The diversity of parts used in modern day electronics is staggering. Fifty years ago you could probably house the required parts for everything on the market at the time in a small warehouse. Today it would require a small country devoted to warehouses filled to the roof! One example of this is a small parts distributor that touts that they have 500,000+ parts on hand – and they recycle and parts-harvest 2000+ TV’s per week! Because of this, parts are available for a good portion of existing electronics and so service centers like ourselves are able to repair our customers’ equipment. The big question these days when somethings breaks is, “Is it worth repairing”? The answer is, for the most part, yes – as long as it is not some ancient artifact from the ‘50’s or ‘60’s, and it is in reasonable condition (not physically broken into pieces). There are some things that can’t be repaired reasonably, like broken panels in LCD or plasma TV’s that have cracks in the screen. Otherwise, used or new parts can be found and repairs made at a reasonable cost. If you are wondering if your equipment is worth repairing, it is always best to ask. Get the device evaluated at a reputable shop. Most shops will give you a good idea for free if it is worth repairing or not. TV Specialists, at no cost, always advises new potential customers of the reasons to repair or not to repair a unit. Thanks to Ken and his fellow TV repairmen (as we were referred to back then) TV Specialists grew larger and hired more technicians. 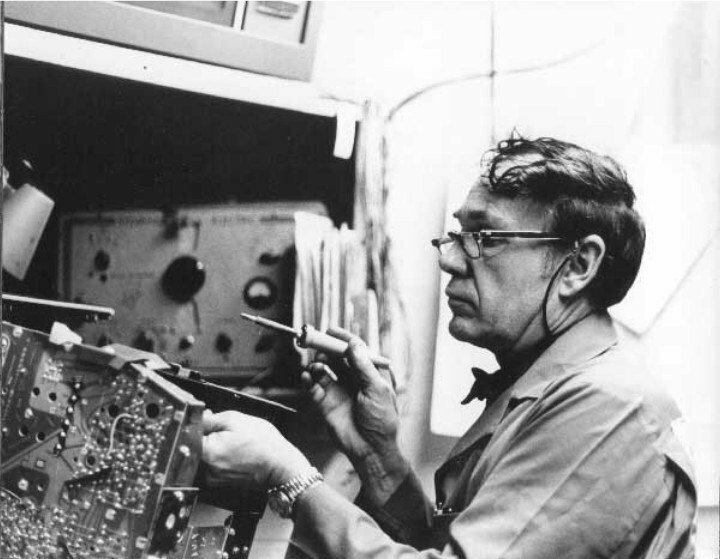 The volume of servicing electronics proved to be a profitable, steady business that allowed TV Specialists to grow in many different directions, including Studio Video production sales in the early ‘70’s. Service will always remain a key part of TV Specialists, providing the “service of what we sell” attitude and commitment. This entry was posted in AV Solutions and tagged factory authorized repair center, flat panel repair, projector repair, tv repair, video equipment repair.